As we approach the MFC-EMN Annual Conference, we asked every moderator to pitch their workshop in a short video—telling you what to expect and why you should join in. Haven’t signed up for the conference yet? Act fast – you’ve only a few days left! On-line registration will close on 24 September, after which time registrations can only be completed on-site at the conference. The use of digital solutions, process automation and new technologies is a clear and recent trend in microfinance and financial inclusion. Increasing efficiency is a precondition to offering financial services to a broader range of clients at reasonable prices. At the same time this results in an increasing volume of data which needs to be properly managed. The purpose of the workshop is to better understand the potential challenges and solutions on how to capture & analyse data in a good way and make reasonable decisions. Looking to expand your range of activities and develop your fundraising strategy? Not sure where to start? This fundraising workshop will share ideas and best practices from MFIs that have successfully raised funding to capitalise their loan funds. We will share a wide variety of approaches to fundraising with the aim of inspiring you in your endeavours. Facilitator: Paul Kalinauckas, Chief Executive, BCRS Business Loans. This workshop aims to help managers identify the questions and steps they need to consider when starting the digitalisation process. Two leading MFIs with experience in this process – KMF from Kazakhstan and Vitas from Romania – will share the lessons learnt during their digitalisation journeys. They will discuss key considerations, the options they researched, the decisions made, and challenges faced. They have each successfully implemented key digital solutions: a mobile expert solution and a digital marketing platform. Workshop participants will be encouraged to ask questions, and share experiences and any options they are currently exploring or have considered in the past. The final aim is to generate a pool of practical know-how and good practices for those starting a digitalisation journey. Workshop 4: How can communities benefit from crowdfunding? Crowdfunding is a way of raising capital through the collective effort of friends, family, customers, and investors. This approach taps into the resources of a group of individuals—primarily online via dedicated crowdfunding platforms—and leverages their networks. The workshop will discuss the current status, trends and opportunities in European crowdfunding. We will also provide inspiring examples of using crowdfunding for social purposes. The goal of this workshop is to understand technological choices of small(er) MFIs and how do they relate with their business strategy and business model. It is perfect for those who consider changing their technological systems or are about to choose for the first time a software. The facilitator and speakers will examine different more affordable solutions that have recently emerged on the market as Open Source or Software as a Service solutions and the inclusion of strategic investors, all allowing to share financial resources and know how. The objective of the session is to highlight examples of successful fintech innovation in the area of financial inclusion. This includes fintech start-ups working with underserved groups or/and cooperating with traditional financial institutions to support them in increasing outreach to underserved segments of the population, in improving efficiency and/or in offering a better customer experience. The microfinance sector is becoming a market for banks that need to invest their increased liquidity in order to get a benefit from it. Technology and resources can help banks achieve this at a faster rate and cheaper. MFIs are already much closer to the goal and can offer personalised answers. Can the two become allies? This workshop will look at a combination of both types of practitioners to increase the quality and number of microcredits. An efficient risk assessment approach and accurate credit decisions are key to supporting financial inclusion. New technology solutions and systems should support and facilitate this work but are they delivering what we would expect? This workshop will look at instruments and technologies available to foster inclusive risk management as well as traditional and alternative methodologies. Case studies on new approaches (alternative scoring, data mining, social media information, psychometric) will be discussed. Workshop 10: EU Funding for Microfinance: Latest News and Changes! Calling all MFIs in the EU! Representatives from the European Commission (EC), the European Investment Fund (EIF) and the Consortium of Frankfurt School, Microfinance Centre and European Microfinance Network will provide important updates on the programmes and instruments that support microfinance practitioners in the EU. These currently include equity, guarantees, BDS grants and complementary technical assistance. Panellists will also share insights on the forces currently shaping EU access to finance policy, giving you a unique chance to express your policy expectations and concerns. Colleagues from Good.bee – an MFI in Romania will share practical experience from using the EaSI programme. If you are from an EU or EU candidate country, come and ask your questions and give your feedback on the EU support programmes for microfinance. Are you a policy maker wanting to understand how micro-entrepreneurs are embracing the digital revolution? Do you work for a financial services provider and are wondering how MFIs could better support the digital development of micro-businesses? Come and get first-hand information from microfinance clients! This workshop will give the floor to microfinance clients, giving you the opportunity to review the use of digital solutions in your business development strategy. Technology is ever-changing and evolving: customers use technology more and more in their everyday lives and online lending platforms have grown at a massive rate. FinTech has become a buzzword. But how do MFIs choose what technology will enhance their relationship-based approach with customers and improve efficiency? This workshop will look at good practices and practical case studies from MFIs that have integrated technology into their daily operations, helping participants to effectively develop & implement future tech strategies and avoid potential pitfalls. Applying financial health lenses to diagnosing microfinance clients allows better identification of their vulnerabilities and thus improves risk management. In addition, human resources departments can employ this tool among their staff as ongoing support for staff development and to improve their well-being. This session will present a financial health diagnostic tool, integrated with rules of thumb for clients and staff. The tool can be used by MFIs as part of their social corporate responsibility towards improving the financial literacy of clients and staff. The guidelines, which are rooted in behavioural economics, lead clients to quick wins in their personal money management. The tool is automated and requires little effort from MFIs. The workshop will look at the first experiences of financial institutions testing it with their clients and staff. The participants will experience the customer’s journey from the financial health diagnosis to the medicine. Workshop 16: How can digitalisation improve your BDS Services? How can digitalisation improve your BDS services, maximise your outreach and improve your clients’ financial capabilities? 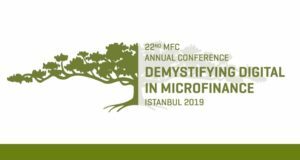 In this interactive workshop two MFIs (EMN members) and one NGO (MFC member) will briefly present various e-learning and virtual training tools (ranging from business planning to housing microfinance), they will talk about how and why they developed them and share about their different uses. During the workshop you will be able to get behind a laptop in pairs to experience these digital education tools first hand. Come and get inspired to create your own!